Nohkalikai Falls is the tallest plunge waterfall in India. Its height is 1115 feet (340 metres). The waterfall is located near Cherrapunji, one of the wettest places on Earth. Nohkalikai Falls are fed by the rainwater collected on the summit of a comparatively small plateau and decrease in power during the dry season in December - February. Below the falls there has formed a plunge pool with unusual green colored water. According to legends, in a village called Rangjyrteh, upstream from Nohkalikai Falls, a woman named Likai resided but had to remarry after her husband's death. Ka Likai (Ka is the prefix given for the female gender in Khasi) was left with her infant daughter with no means of income. In order sustain herself and feed her child she had to become a porter herself. Her work required her to leave her daughter unattended for long intervals and when she would be at home she would spend most of her time taking care of her infant. She realized that raising a child required both parents, so Ka Likai married a second time for the sake of her daughter. However, being a mother to an infant, her daughter needed her constant attention so could not give to her second husband the love he thought he deserved. A jealousy grew in her husband which manifested to hatred towards Likai's daughter. He killed the infant in cold blood and cooked her flesh after throwing away her severed head and bones to hide all trace of the murder. When Ka Likai returned home, she noticed that her house was empty and nobody was home. A meal that had been prepared but she did not find anyone around. She wanted to go look for her daughter but she was too famished from all the labour she had been doing so she ate the meal till she could not eat anymore. Ka Likai usually had a betel leaf after her meals but she found a severed finger near the place where she usually cut betel nuts and betel leaves. Ka Likai realized what had happened in her absence and went mad with anger and grief and started running as she swung a hatchet in her hand. She ran off the edge of the plateau and jumped to her death as she could no longer bear the thought of cannibalizing on her dead daughter unknowingly. The waterfall where she jumped from was named Nohkalikai Falls as a grim reminder of a tragedy that befell an unfortunate woman. Wikimedia Commons has media related to Nohkalikai Falls. ^ "Nohkalikai Falls". World Waterfall Database. Archived from the original on 26 July 2012. Retrieved 6 May 2012. ^ "Nohkalikai Falls". World Waterfall Database. Retrieved 18 December 2007. ^ Gatis Pāvils (28 August 2010). "Nohkalikai Falls". Wondermondo. Retrieved 29 August 2010. 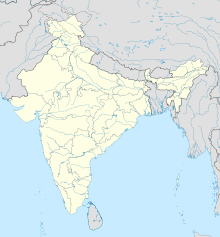 This article related to a location in the Indian state of Meghalaya is a stub. You can help Wikipedia by expanding it. This page was last edited on 20 March 2019, at 20:52 (UTC).